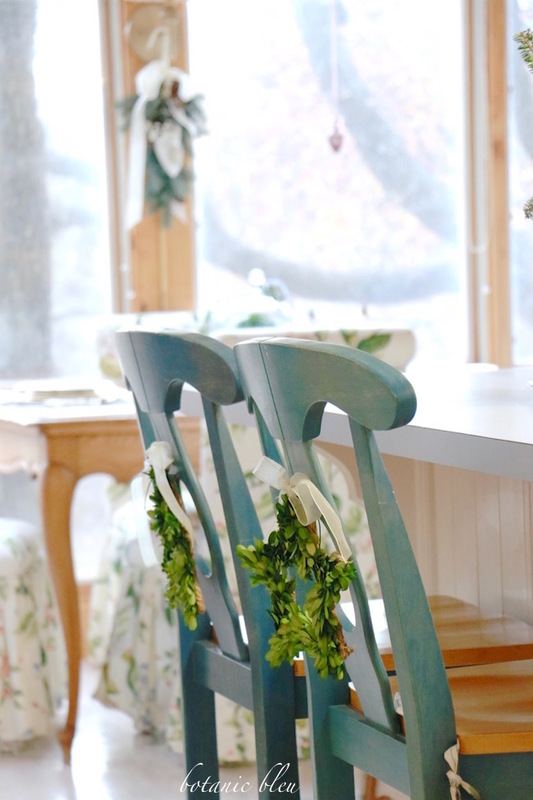 Good food, laughter, and love... in our French country Christmas kitchen of blue and white. 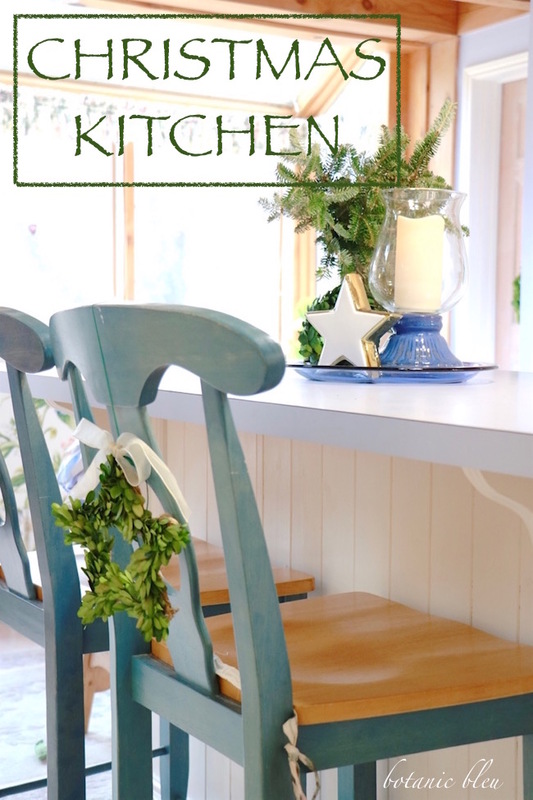 Come on in to our kitchen and sunspace ready for Christmas, dressed in greenery and everyday blues. 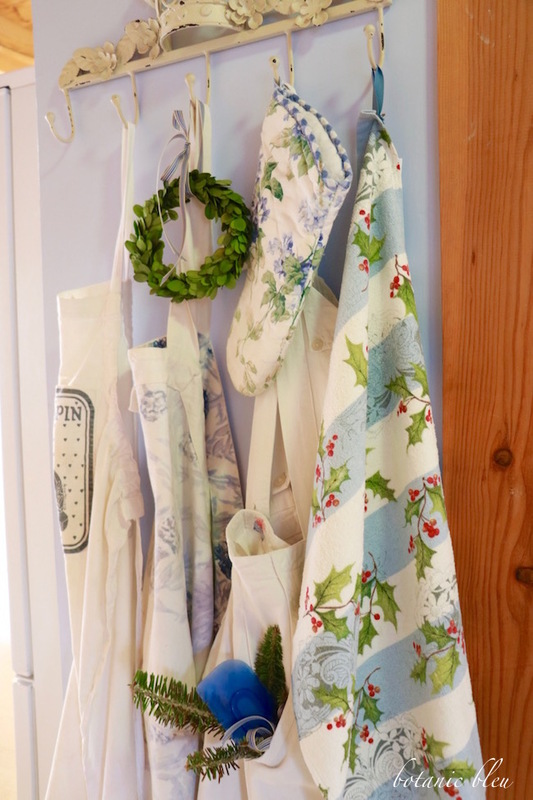 Aprons, dish towels, and pot holders are ready to prepare Christmas dinner. 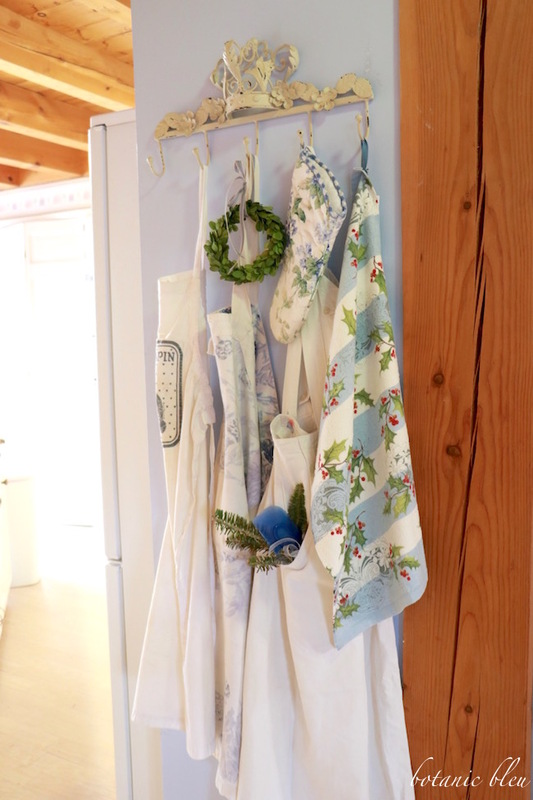 Not to mention an everyday blue spatula dressed for Christmas peeking out of a pocket of the vintage French apron from a Paris flea market this fall. More about the apron and the adventure finding the apron in a post in January 2017. A little closer sneak peek at the French apron's bodice collar and button. Today is all about removing hot dishes from the oven and washing and drying those dishes later. 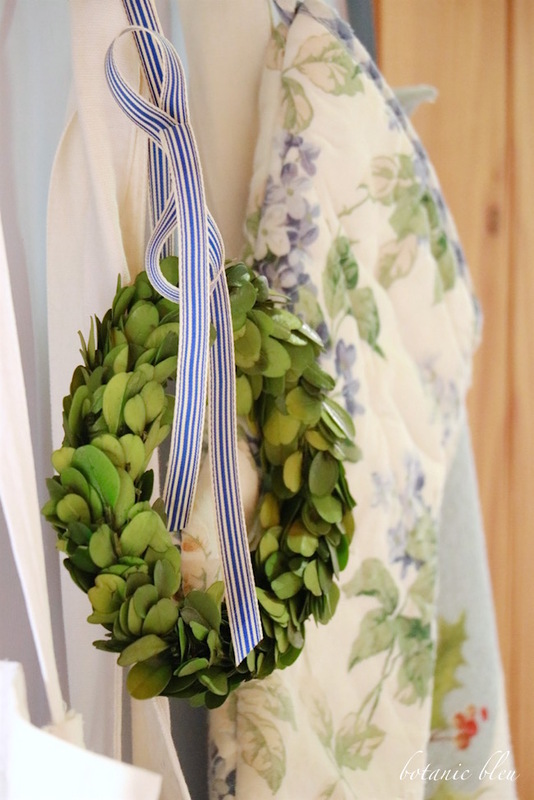 Everyday potholders become festive by adding a beribboned preserved boxwood wreath. This just goes to show that any color can be a Christmas color.... with the right accents, like ribbons and greenery. 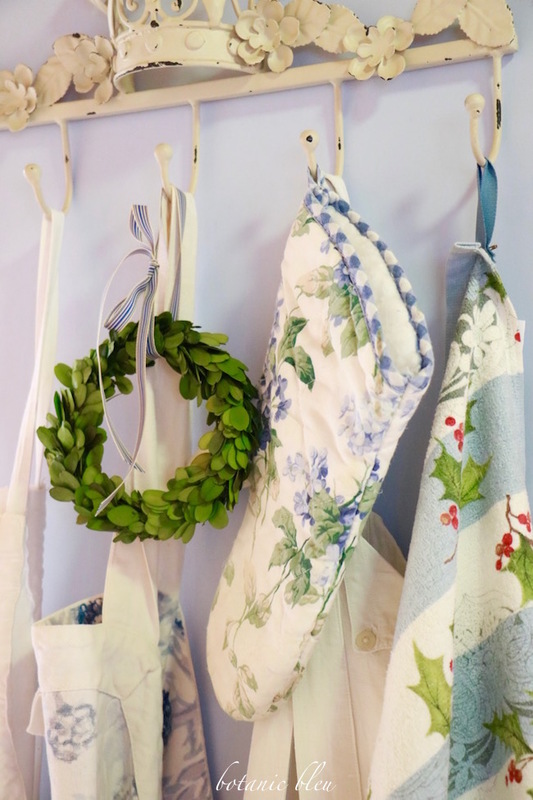 Add a little Christmas cheer to cooking ingredients by choosing holiday red and pretty labels. 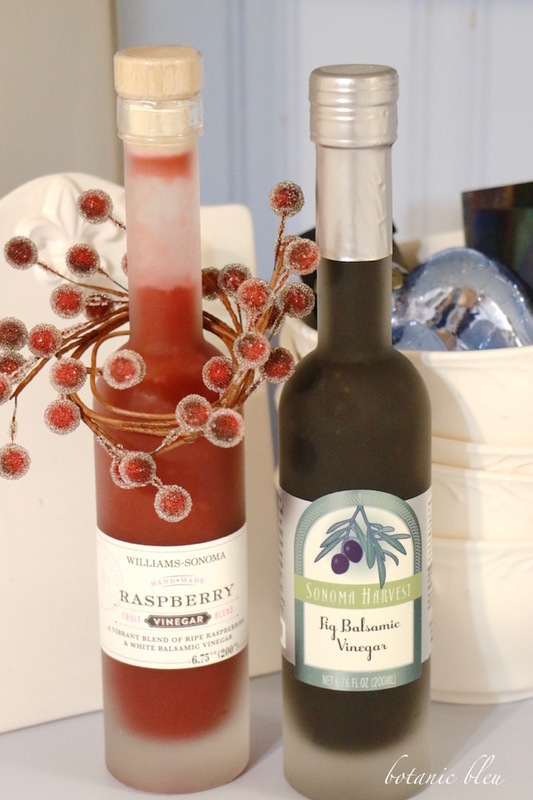 Pop a ring of artificial snowy berries around the bottle and voilà... NOEL. A Christmas bird with a sprig of greenery in his beak, a chippy child's chair, a contained island centerpiece, and star-shaped preserved boxwood wreaths on counter stool backs take the everyday blue and white kitchen into Christmas Day. 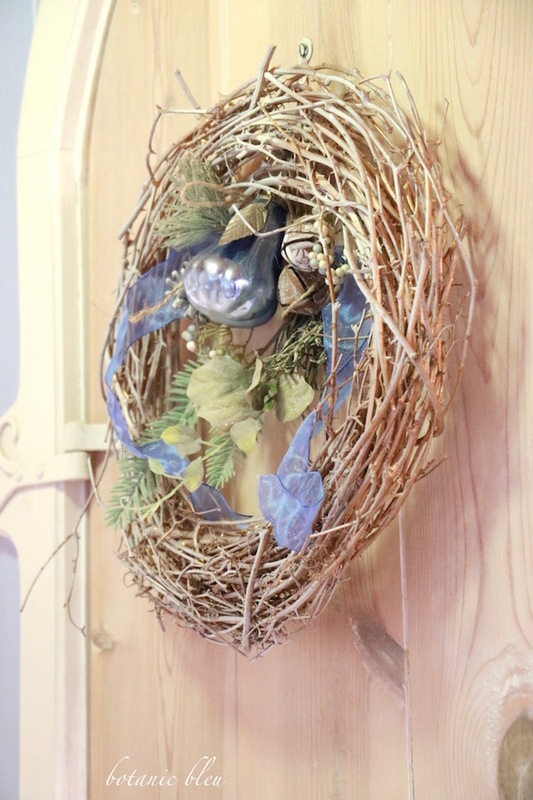 As my sister says, "Another opportunity to use a boxwood wreath." Don't let her kid you, she LOVES boxwood. Since the island will be filled with food for serving a buffet meal, the centerpiece is kept to a minimum. 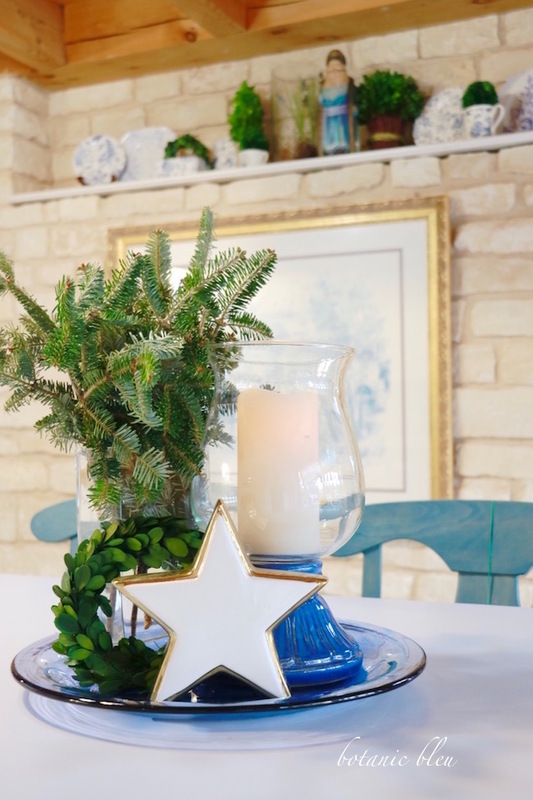 Greenery, a gold-trimmed white star, and yet another opportunity to use a boxwood wreath, say, "Merry Christmas," to the blue-based candle and large blue glass plate. Placing an arrangement on a large platter, or in a box, or in a basket, allows the arrangement to be repositioned with just a blink of an eye. 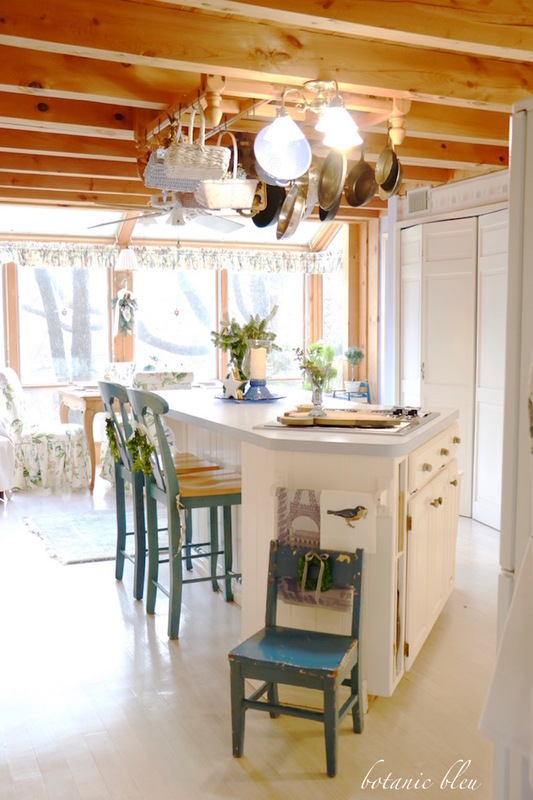 The entire arrangement can be moved to another spot if more room is needed on the island. 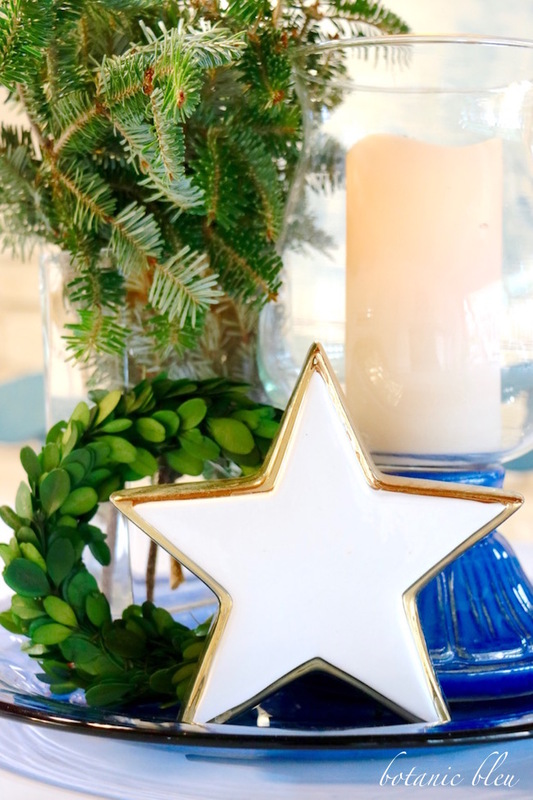 Plus, just by turning the plate, the star can face whatever direction you want to greet people. This is the view I see each morning coming from my bedroom that is adjacent to the kitchen. When guests arrive, the arrangement is rotated to greet people entering the kitchen from the entry. 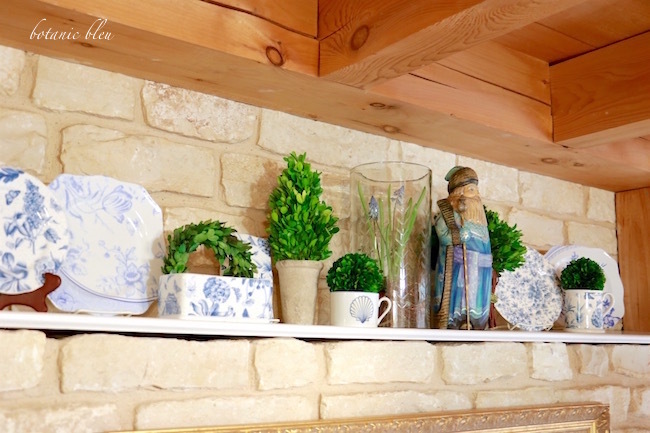 High above the frenzied holiday action, the shelf decorated with everyday blue and white dishes, more boxwood, and a treasured wood-carved Russian blue Santa are safe from accidents. 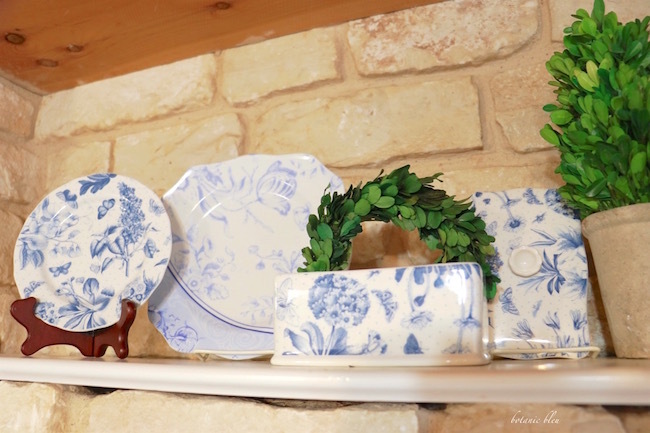 These are a few of my medium blue and white dishes collected over a lifetime. Adding the blue Santa and preserved boxwoods turn the collection into a Christmas display. The small plate and covered butter dish pattern name is Botanic Blue (by Portmeirion), and is the namesake for Botanic Bleu. 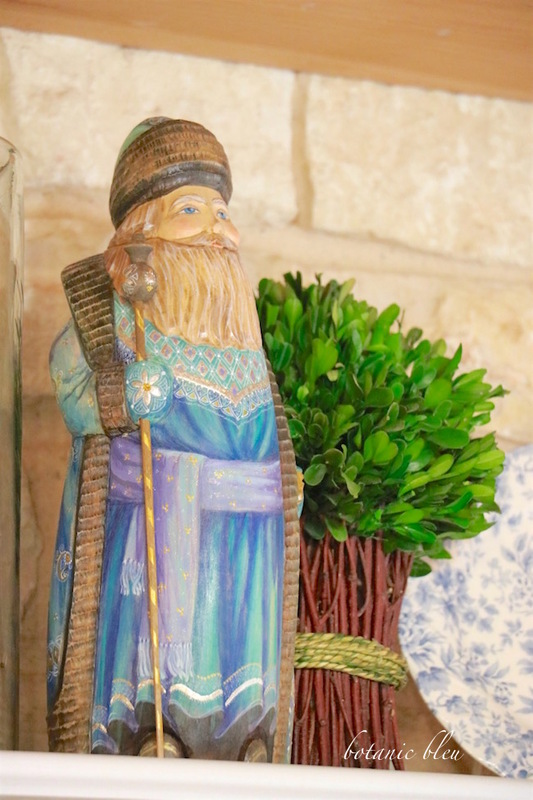 Blue Santas are not easy to find, but do exist. This one was a very special Christmas present from my husband many years ago. Sometimes the best buys just happen. One year I drove hours to Chapel Hill Market in Alabama for a chance to buy some white stoneware from Miss Mustard Seed. I was so disappointed that all of the stoneware was gone by the time I arrived. This small blue chippy child's chair was in another vendor's booth. Since I bought no stoneware, I had money to buy this chair (and other things) instead. I use it as a quick step stool in the kitchen. 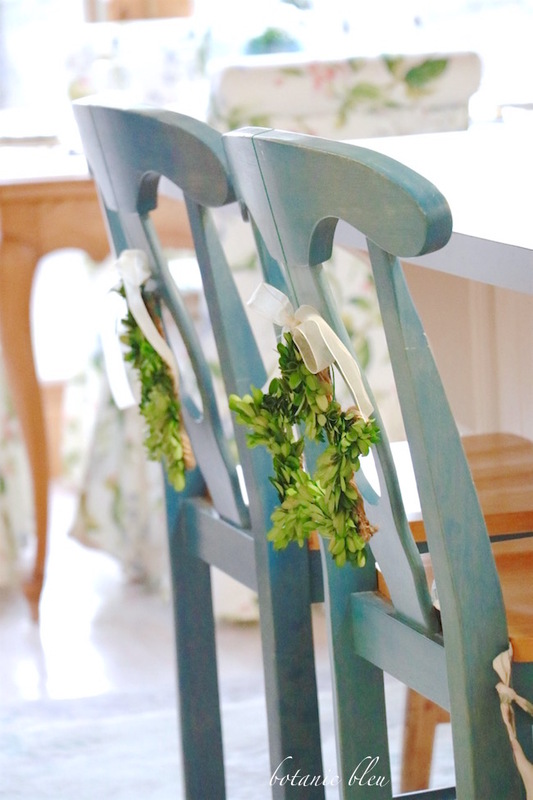 Of course, another boxwood wreath found its way on the back of the blue chair. Merry Christmas to all, from my kitchen to yours. You are a Christmas blessing to me. No Monday Social this week. Enjoy Christmas with your family. Joyeux Noel! It all looks pretty. Love blue accents! I love the shelf and the perfect blue Santa from your husband. Merry Christmas. I hope it was a great day. Absolutely lovely! How special your guests must feel when walking into your house. Wishing you a joyous Christmas and New Years. 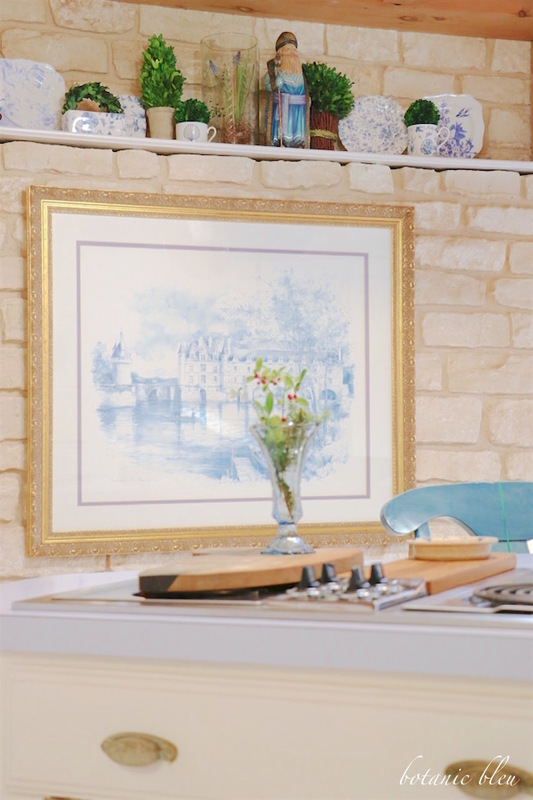 I love all that light in your kitchen and eating area. All of your touches of blue are perfect with nature's backdrop. 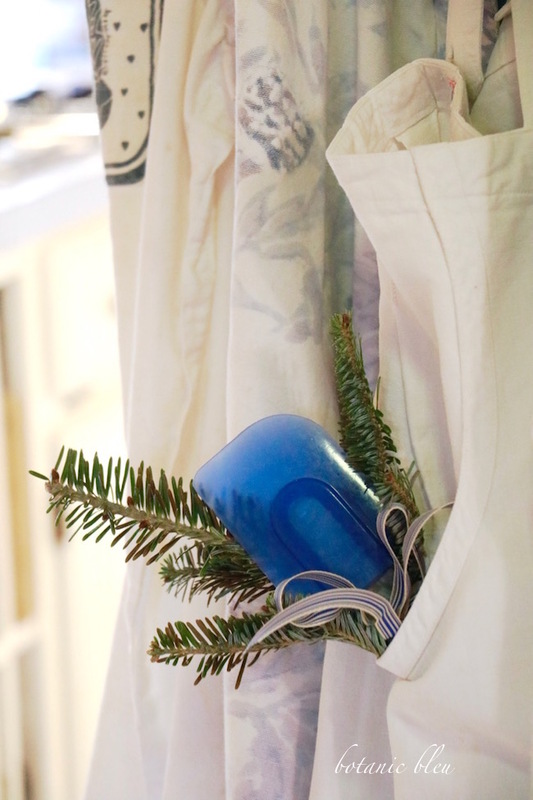 And your Blue Santa is so perfect perched up with your Botanic Blue dish ware. You've got a keeper of a husband! 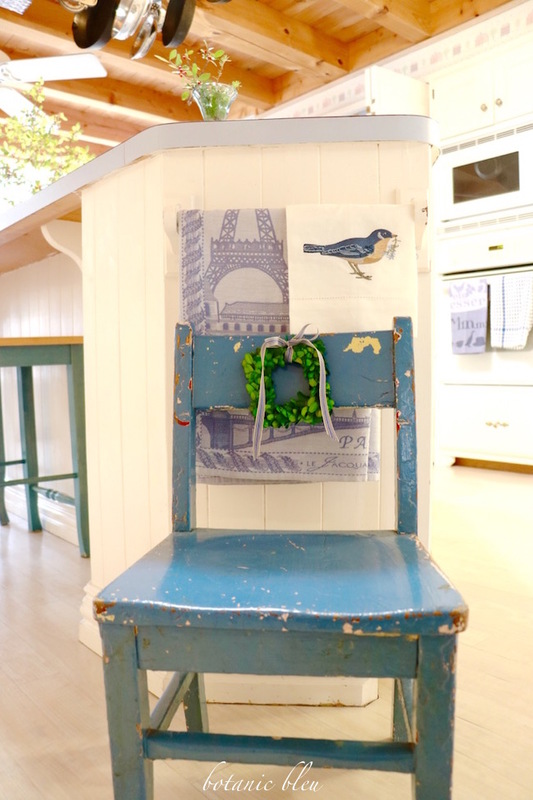 It all looks perfect, but that little blue chair stole my heart! Lovely photos! That Santa is adorable. 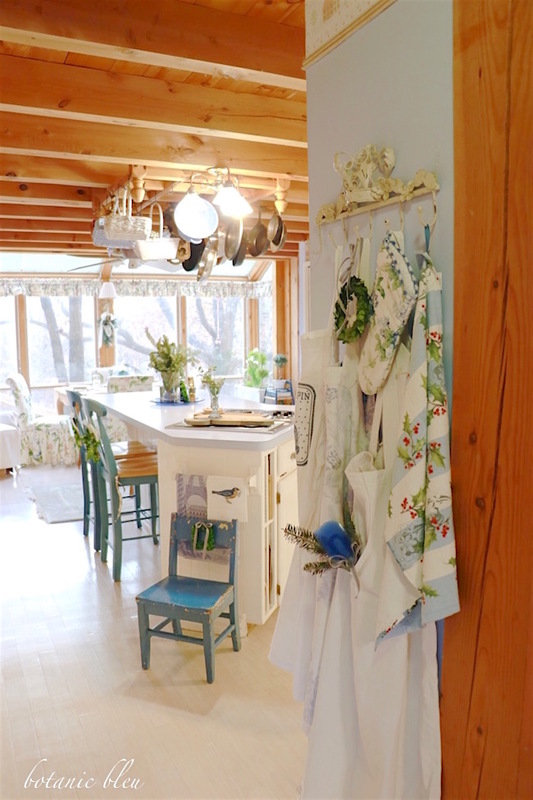 Your kitchen is light and sweet in blue and white. This is so very pretty! I love the blue and white. This year I plan to paint our bathroom in a pretty blue. Thanks for the beauty! 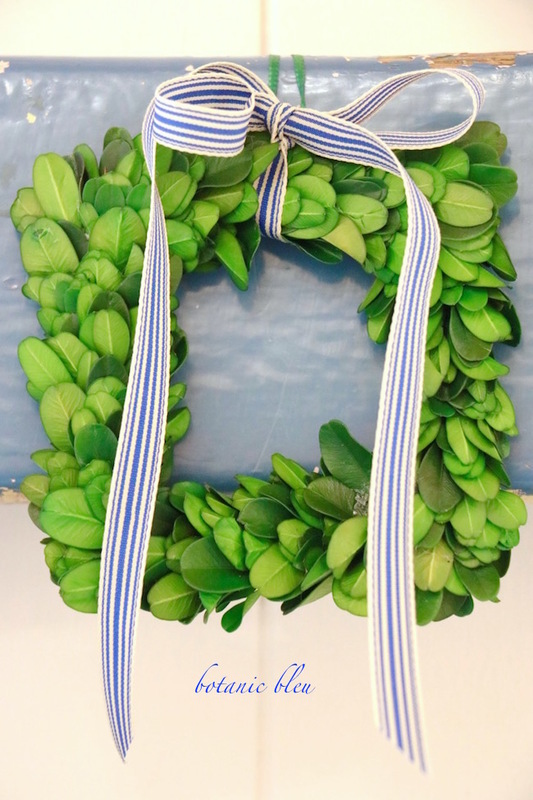 Love love love all the boxwood wreaths! Especially the star shaped ones. So pretty! Thank you for sharing at Dishing It & Digging It. I look forward to seeing more of your creativity this year!